Hull is the central and oldest part of the city of Gatineau, Quebec, Canada. 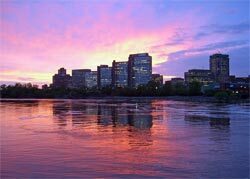 It is located on the west bank of the Gatineau River and the north shore of the Ottawa River, directly opposite Ottawa. As part of the Canadian National Capital Region, it contains offices for twenty thousand fonctionnaires or civil servants. Hull is a former municipality in the Province of Quebec and the location of the oldest non-native settlement in the National Capital Region. It was founded on the north shore of the Ottawa River in 1800 by Philemon Wright at the portage around the Chaudière Falls just upstream (or west) from where the Gatineau and Rideau Rivers flow into the Ottawa. Wright brought his family, five other families and twenty-five labourers and a plan to establish an agriculturally based community to what was a mosquito-infested wilderness. But soon after, Wright and his family took advantage of the large lumber stands and became involved in the timber trade. Originally the place was named "Wrightville" (or sometimes "Wrightsville" or "Wrightstown"), which survives as the name of a neighborhood in Hull. While Wright arrived by way of Woburn, Massachusetts, the settlement was renamed after the name of his family's original home town Kingston-upon-Hull in the United Kingdom. From Wikipedia, the free encyclopedia.